Starting a new creative project is never easy and over time I’ve learnt there are several integral phases to the process that you simply have to knuckle on through before getting lost in a creative mess! So with the first month of the new year and my artist residency with Cotswold Life out of the way it is safe to say that I am well on the way to Stage Two, the ‘Getting Sorted’ stage, which mostly involves sharpening pencils and lining them up in order. However, the last month has mostly been about Stage One; ‘The Lightning Bolt Moment’, when I research, sketch and read until something strikes! Sometimes it can take weeks, sometimes months…however it rarely takes days! I clearly underestimated the allure of the Cotswolds. 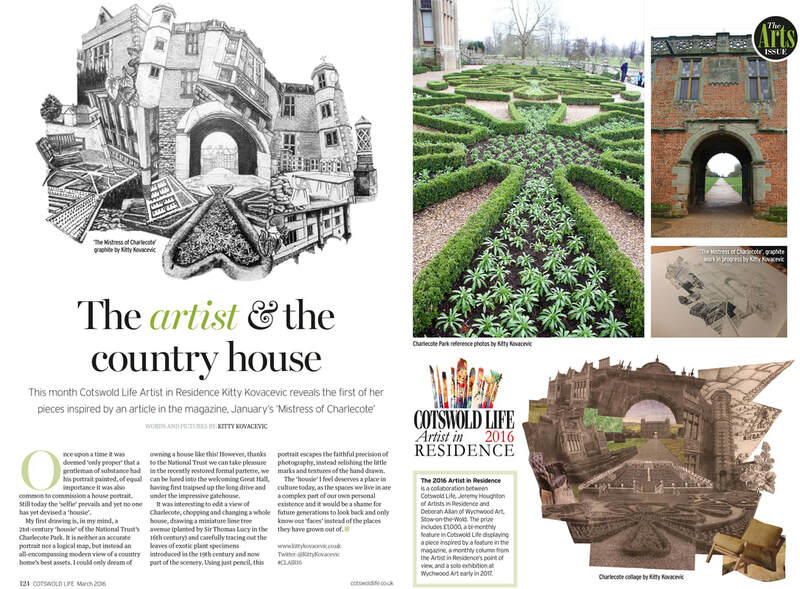 Sitting back flicking through the January issue I was immediately drawn to the heritage piece ‘The Mistress of Charlecote’ the story of Mary Elizabeth Lucy of Charlecote Park. The National Trust park & garden is currently being restored according to the previous Lady’s formal Victorian designs. Being a huge fan of old maps and architectural drawings I was instantly reminded of ‘The Country House Book’ a gem I first found in the stacks of my university library. Packed with map like rustic drawings of stately homes from the 15th century onwards, amongst the books pages I am sure I recall seeing a picture of Charlecote (if only I had a copy to confirm!). How has Charlecote changed since then and what would Mary Elizabeth make of this 21st century restoration? 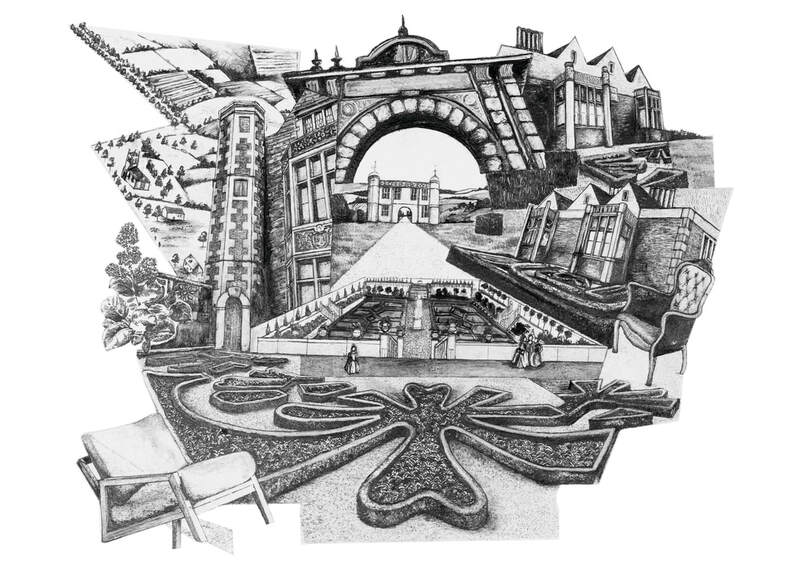 The Trust’s rationale is to ‘create a garden of national interest’ whilst linking it with the past. What are we creating now that would be worthy of this? The Cotswolds is rich in heritage and whilst photographing Shipston, Broadway & Buford as part of Stage One I was overwhelmed by the unique character of each of these places. A character shaped by the present as much as the past. Bingo…lightning, at this rate I will be at Stage Three-‘Actual Work’ ready with some drawings for the next issue. Once upon a time it was deemed ‘only proper’ that a gentleman of substance had his portrait painted, of equal importance it was also common to commission a house portrait. Still today the ‘selfie’ prevails and yet no one has yet devised a ‘Housie’. My first drawing, is in my mind, a 21st Century ‘Housie’ of the National Trust’s Charlecote Park. It is neither an accurate portrait or a logical map, but instead an all-encompassing modern view of a country homes best assets. I could only dream of owning a house like this! However, thanks to the National Trust we can take pleasure in the recently restored formal parterre, we can be lured into the welcoming Great Hall having first traipsed up the long drive and under the impressive gatehouse. It was interesting to edit a view of Charlecote, chopping and changing a whole house, drawing a miniature lime tree avenue (planted by Sir Thomas Lucy in the 16th century) and carefully tracing out the leaves of exotic plant specimens introduced in the 19th century and now part of the scenery. Using just pencil this portrait escapes the faithful precision of photography instead relishing the little marks and textures of the hand drawn. To state the obvious I spend a lot of time drawing and whilst doing so I often drift off on flights of fancy. On many an occasion I’ve been adding the fine filigree to a grand house with my 5H when off I pop. I’ve been miles during these daydreaming ramblings and am currently doing a grand job of circumnavigating the Cotswolds as often thoughts stray towards ongoing projects. This month I have been mapping out the Cotswolds domain in terms of key icons that feature on the Cotswolds Conservation Board’s Area of Outstanding Nature Beauty (AONB) interactive map. If you have never used this tool I recommend a look on their website. 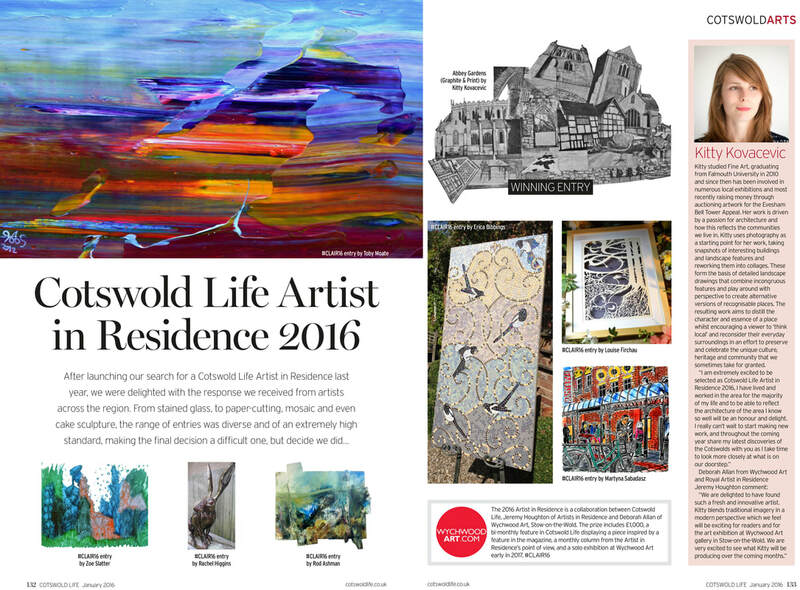 Reading about the Cotswolds AONB’s 50th Anniversary in April’s issue I’ve set myself the impossible task of trying to sum the whole lot up! Never one to shy away from a challenge ‘Drawing HQ’ currently looks like I am staging an assault on the local area. I have created a battleplan of drawings and photos of places I’ve seen or need to see. But what if I miss somewhere? After all 790sq miles is a large area to cover and whereas I enjoyed a solitary stroll around Sezincote Park last week, another person might feel that Kelmscott Manor is more deserving of inclusion. This living landscape will never be immortalised entirely by a pencil as it’s true essence lies within the people who love and care for it’s unique features and sites. Nevertheless I’ll give it a go anyhow! This month things haven’t worked out as planned. 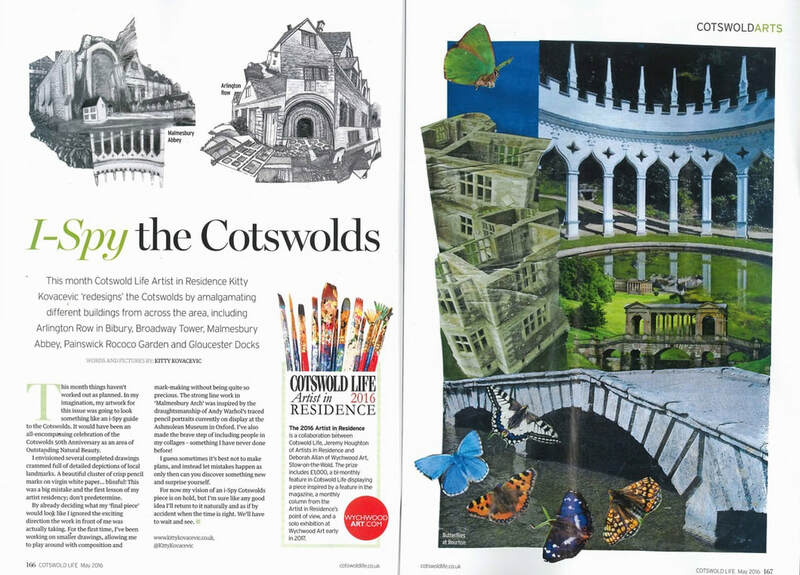 In my imagination, my artwork for this issue was going to look something like an I-spy guide to the Cotswolds. 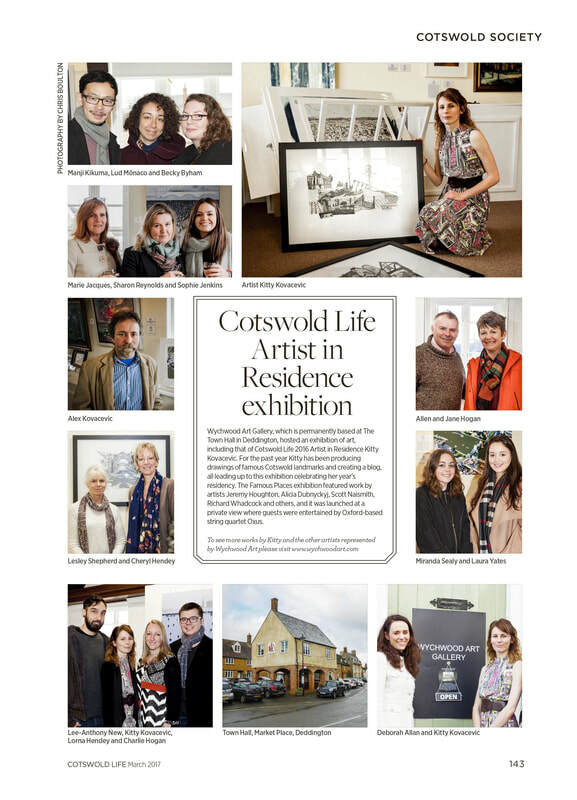 It would have been an all-encompassing celebration of the Cotswolds 50th Anniversary as an area of Outstanding Natural Beauty. 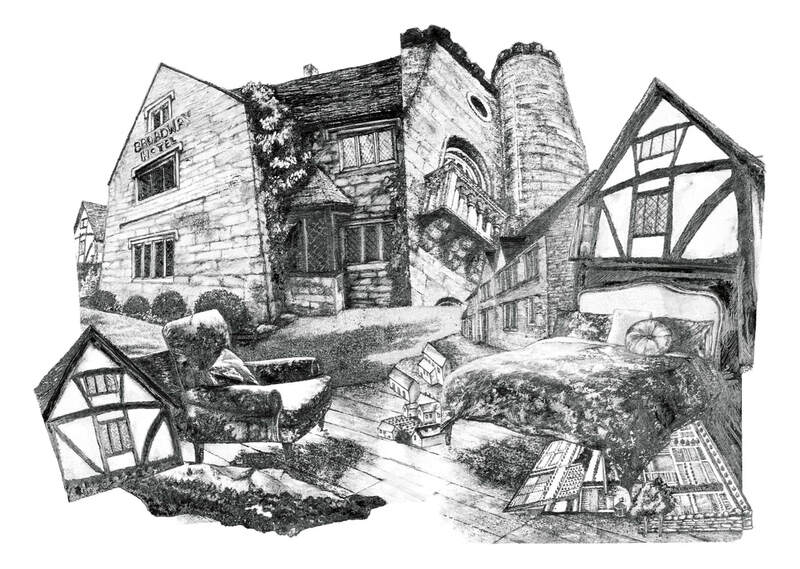 I envisioned several completed drawings crammed full of detailed depictions of local landmarks. A beautiful cluster of crisp pencil marks on virgin white paper, blissful! This was a big mistake and the first lesson of my artist residency; don’t predetermine. By already deciding what my ‘final piece’ would look like I ignored the exciting direction the work in front of me was actually taking. For the first time, I’ve been working on smaller drawings allowing me to play around with composition and mark making without being quite so precious. The strong line work in ‘Malmesbury Arch’ was inspired by the draughtsmanship of Andy Warhol’s traced pencil portraits currently on display at the Ashmolean Museum in Oxford. I’ve also made the brave step of including people in my collages something I have never done before! I guess sometimes its best not to make plans and instead, let mistakes happen as only then can you discover something new and surprise yourself. 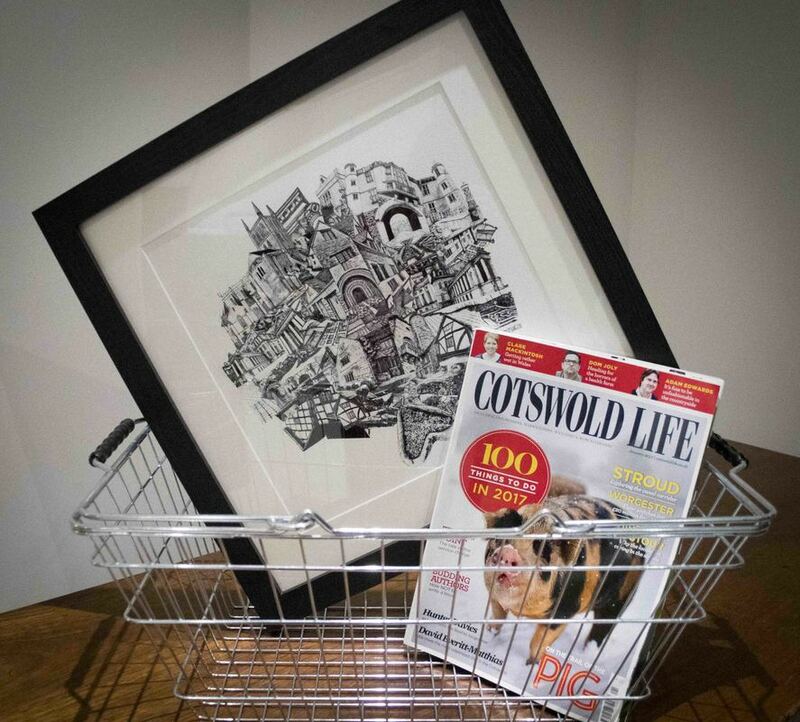 For now my vision of an I-spy, Cotswolds piece is on hold but I'm sure like any good idea I’ll return to it naturally and as if by accident when the time is right. We’ll have to wait and see. Where does all the time go? This isn’t an unusual question but sadly it’s a common one and it applies to almost everything. On a daily basis we complain about not having time to do the things we want to. However sometimes you just have to say STOP and step outside the rush to reclaim something for yourself. This month I had the opportunity to do just that and took two weeks out before starting a new job. At first I thought I’d spend my time leisurely drawing, but this didn’t seem right either. I needed something new and so did my artwork. So I surrendered my pencil and went to Stockholm via London (like you do!). Ahhhh what a relief it was to see something different, to people watch in a new place, and to simply observe. Returning to London I borrow my friend’s university library card and the quest continues in the stacks of the UAL library. This is no spa weekend but feels like I’m being treated. There is so much to take in that I photocopy everything in sight, refuelled on words and pictures…unless you like Mills and Boon our local library sadly doesn’t compare. What does all this have to do with a drawing of Cheltenham? Back home again I look at my half finished A2 and see a different drawing than the one I first started. Maybe it’ll be better to try graphite powder and scratchy lines on the pump room columns rather than overdoing the white pastel? Feeling excited I get started and find out…what do you think? The moment anyone mentions Broadway you will instantly think of Broadway Tower. Such is the power and allure of this quirky folly, and although I have drawn it before I’ve never been able to truly capture this romance and charm. Constructed in the late 18th century as a decorative jewel for the surrounding landscape, it’s mock battlements contrast to the impractical French style sash windows and balconies. Although utilised as an observation point during WW1 and the Cold War (hence the neighbouring Nuclear bunker which is well worth a visit! ), the tower is technically at odds with its surroundings and stands apart both geographically and architecturally from Broadway itself. An yet I doubt anyone could imagine Broadway without a tower! This foolish folly demonstrates perfectly the powerful part buildings play in our understanding of identity. When William Morris and his family stayed there it was simply known as “The Tower” and yet over time it has become synonymous with Broadway itself. Similar to Morris’s own Cotswold retreat of Kelmscott Manor to Kelmscott, or Blenheim Palace to Woodstock (more on both of these another day!). In all of these cases these buildings evoke such warmth and praise from locals and tourist alike. They capture our imagination whilst upholding the qualities unique to those communities. Back in my studio I start collaging photos from my recent trip Broadway, if I look up and squint the Tower is a pinprick on the horizon, a reminder of what I hope to capture with my pencil and paper. Over the past few weeks I’ve settled into a rather cosy drawing routine and like most people who know when they are on to a good thing I’m a little fearful of when this period will come to an end. Without fail I’ve sat down every evening with a cup of coffee, started sharpening my pencils and then set about drawing. Several uninterrupted hours later I will wake up thinking I have time travelled into the future gasping with amazement at the clock as I realise I’ve spent at whole night drawing roof tiles or some other feature. This makes for interesting conversation at work the next day when someone asks what I did last night and I reply “ I spent the evening drawing a Cotswold stone wall”. I sometimes wonder if I should make polite excuses for my obsessive activities or if behind closed doors other people are similarly occupied. In this month’s drawings I have throughly enjoyed working on the smallest details, finding the simplest joy in planting the prickly fine lines of the manicured lawn seen in “Staying in Broadway”. I can’t remember how long it took me draw the black and white beams of Broadway Hotel or carefully sketch out the stonework and balconies of Broadway Tower however I can’t imagine anything else I’d rather be doing. Fingers crossed this 2B bliss lasts as long as possible as whilst everyone jets off on summer holidays I don’t plan on going anywhere except maybe Blenheim to do some sketching for my next piece! 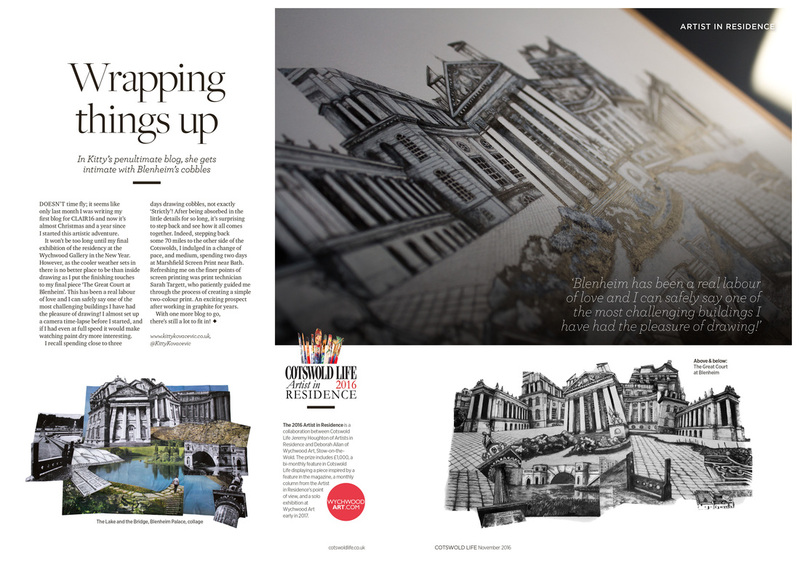 I think I’ve discovered what is to be my biggest challenge yet, drawing Blenheim Palace. After driving through Woodstock with my friend many years ago we vowed we’d visit Blenheim together one day. Ten years later, and it was definitely worth the wait! Blenheim simply would not be built today, the grandeur of its design, the craftsmanship, and the sheer scale are almost unheard of now. Furthermore, Blenheim harbours something money can never buy, a beauty earned through the passage of time. Sketching on the front steps I was overwhelmed by the sheer scale of capturing such a place on the square of paper in front of me. Who was I to comment on the craftsmanship that has gone into this monument? After all my house is adorned with Ikea and built by Taylor Wimpy, not Vanbrugh or Hawksmoor. But then the same can be said of most people, although most people aren’t trying to draw a palace. This set me thinking. How can my drawing mean something in the grand scheme of Blenheim's rich history? The always articulate Churchill provided the answer “We shape our buildings; thereafter they shape us”. A sentiment that in this context seems to sum up my journey so far. Inspired by Blenheim my work will be shaped by taking up this artist challenge, a challenge for myself. After all the master craftsmen who shaped Blenheim, and the true value of their endeavour, can only fully be appreciated by the next generation. For me a successful drawing is one you can go back to time and time again. When I was stewarding in an art gallery (a long time ago now!) I remember really enjoying the quiet hours spent staring at the same pictures over and over again. This was never boring as I soon began to appreciate that whenever this happened I’d discover some new detail in the artwork that I’d never noticed before. Since visiting Blenheim last month I couldn’t wait to get started developing my photos into collages ready for drawing. I painstaking set about cutting out columns and piecing porticos together. I have made collage after collage but like Goldilocks I have struggled to find one that’s ‘just right”. Until I suddenly realised I’d overlooked something rather important…the little details! When working on a piece I look for elements of a place that convey something more than just what it looks like. For the Blenheim collages I wanted the viewer to be transported to the The Great Courtyard surrounded by grand columns and looking around in awe. However, I’d forgotten about the feeling of anticipation that went beforehand, the walk across the sweeping lawn from the lake, or the way the cobbles in the courtyard draw your eye towards the front entrance. I’d neglected to include any of the finer details that helped make up this scene, a bit like drawing a smily face and calling it a self portrait. If there is one thing we all know for sure it’s that the little things matter! This week I packed up my pencils, not because this is my final blog but simply to finally clean away the grey pencil marks, rubber dust and other drawing detritus that has built up on my studio (living room) floor over the past year. The floor in question is white wood laminate and after a year of pencil sharpenings, graphite powder and coffee rings it has now gained the ‘vintage’ look of real wood. Don’t get me wrong I do clean the house, however whilst in the midst of drawing the last thing I’ve thought about is the dusting! It has been a delight getting throughly carried away exploring the Cotswolds and a real anthropological challenge deciding which buildings or features to include within my work. I’ve been inspired by historical houses such as Charlecote and Blenheim, charmed by Arlington Row and caught in the buzz of Regency Cheltenham and Gloucester Docks. The one thing that has struck me the most is the real sense of community pride these buildings represent and I hope my drawings throughout the year have captured this.